This picture has been contributed by Dr. Sanjay Behari, Department of Neurosurgery, Sanjay Gandhi Postgraduate Institute of Medical Sciences, Lucknow, Uttar Pradesh. These 'diamond-shaped mist and snow-covered icebergs arising from the sea' appear to be integral components of an image taken in Antarctica. 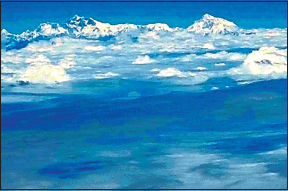 This is actually a view of the Himalayan ranges seen from above the clouds. This picture was captured from the window of an airplane on a flight from New Delhi to Bagdogra, Darjeeling district, West Bengal, one autumn evening. The plane flies parallel to the Himalayan ranges on that flight, and on a clear day, the snow on the majestic mountains that brilliantly reflects the waning light of the sun is clearly seen from the airplane window. As one looks from a distance, all the different elements in the photograph, the deep blue sky above, the mountain peaks and the clouds at eye-level, and the greenish hue of the forest and the river below, merge into one beautiful pastel painting…and therein lies a message for all of us. Was not the price of ambition too high? 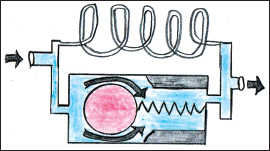 Chatterjee S, Harischandra L. Cerebrospinal fluid shunts—how do they work: The basics. Neurol India 2018;66:24-35. Vemula VRC, Prasad BC, Jagadeesh MA, Vuttarkar J, Akula SK. 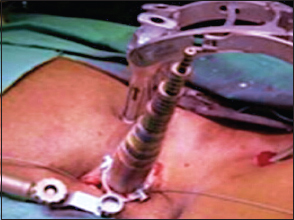 Minimally invasive total lumbar interbody fusion using bone cement augmented pedicle screws for lumbar spondylolisthesis in patients with osteoporosis. Case series and review of literature. Neurol India 2018;66:118-25.